Numbers of domain registrants and developers matter most. How many domains are registered across your country? How many programmers are there, who might help developing any domains? No other data is more relevant for the progress of your people. Numbers of domain registrants and developers matter most. 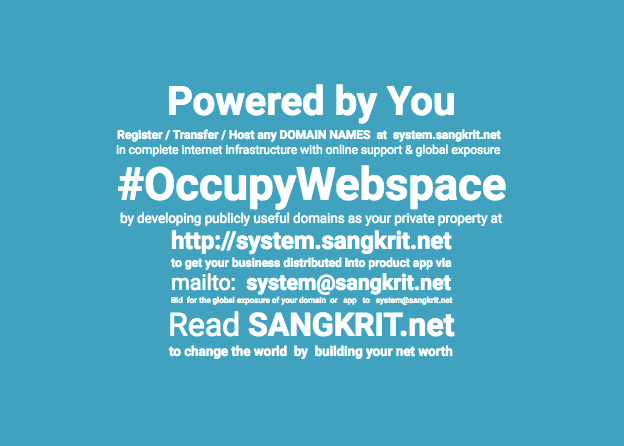 Signing-up for free SANGKRIT.net account to work as personal outlet resolves for both via your free personal business account. Privately owned domains need to become publicly useful for enhancing individual worth with increasing income. Life gets made of necessity and utility determining evolution in a routine. Your ecosystem governs the genesis of any necessity and utility for you. Following that paves the way for your prosperity. Women must own domains. Men must know programming them. Children could be practicing any necessary languages for developing their own domains. SANGKRIT.net does that everywhere. People are encouraged by personal outlets. They register/transfer domains at http://system.sangkrit.net as it paves the simplest way for developing business with online support and global exposure and domains’ demographics determine WorldWideWeb dominance.